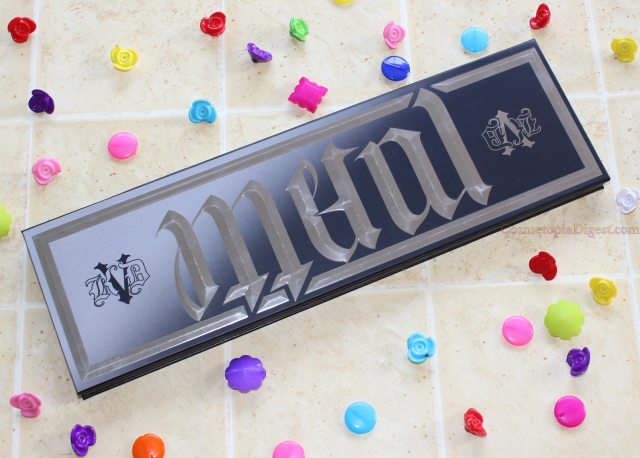 The Kat von D Metal Matte Eyeshadow Palette launched in Sephora Dubai a couple of weeks ago. My Mum had asked me to get her a couple of brow products, and told me to get something for myself, on her. I decided to pick this one up. 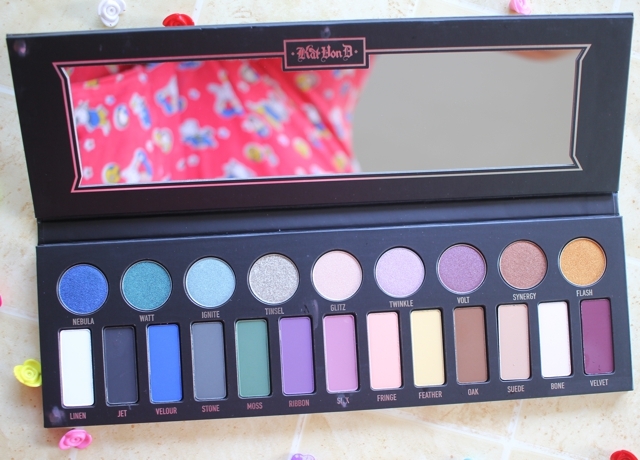 This palette has sold out online in the US, but those with access to a Sephora which stocks Kat von D can pick it up in-store. 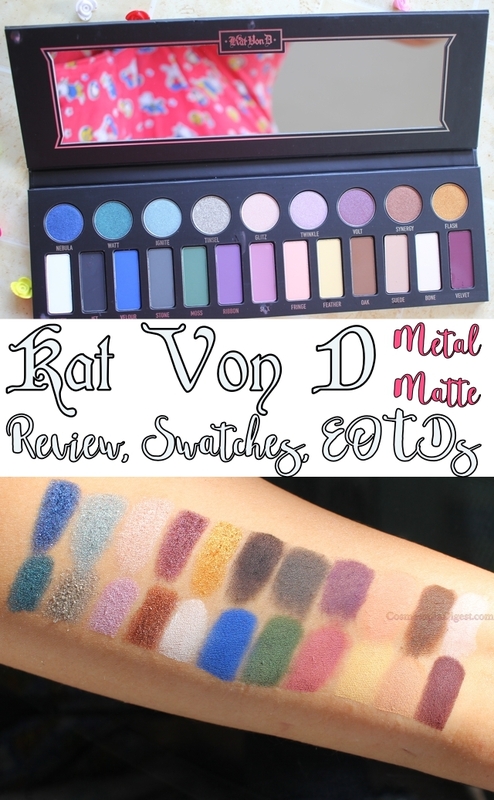 Scroll down for the review, swatches and eye makeup looks with the Kat von D Metal Matte Eyeshadow Palette. 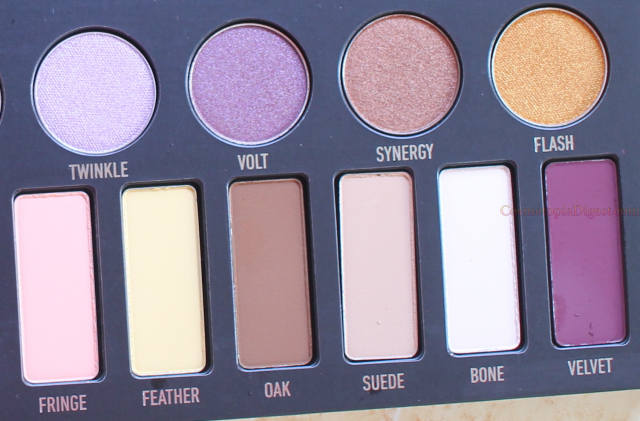 The packaging is what you might expect from a KVD palette. Lots of black and silver. Cardboard, this one. Interestingly, the two words that comprise the name of the palette - Metal Matte - can be read from the same typography on the lid when you hold the palette the right way up and upside down. This is the longest palette I've seen in a while. It measures 11.5'' x 3.6''. 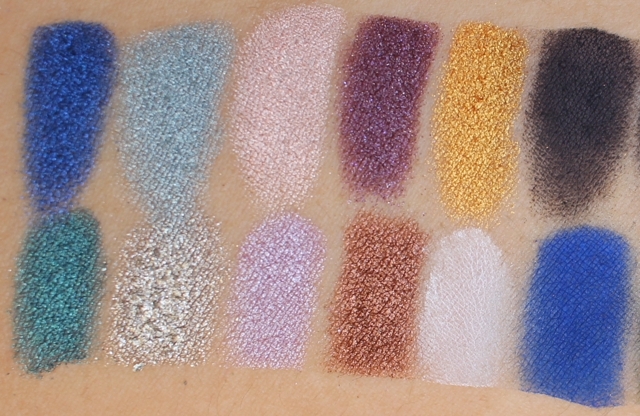 There are 22 eyeshadows, of which nine are "Metal Crush", while 13 are matte. Apart from Tinsel, which is a silver chunky glitter (and therefore will not suit me), I've worn all the shades through the day without problems. 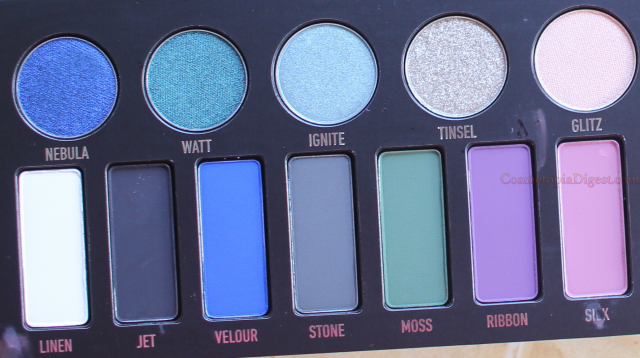 After a bazillion risque names, it is refreshing to find a palette with "normal" names for each shade. Since pictures are worth thousands of words, I'm not going to describe each colour. There is so much variety in this palette. Mattes. Metallic/shimmery shadows. Brights. Nudes. Unlimited looks. I would say this is the most consistent palette I've seen in a while, formula-wise - every shade performs beautifully, even without primer. No creasing or fading after a full work day. You get full opacity, blendability and colour payoff with just the one swipe. 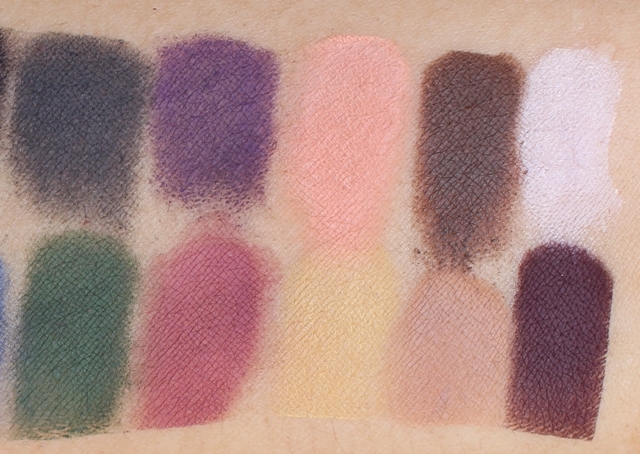 None of the mattes was chalky or sheer. As I said, I'm not fond of Tinsel - silvery shades do not suit my skintone, and the chunky glitter isn't my favourite. But 21 out of 22 shadows is a great score. 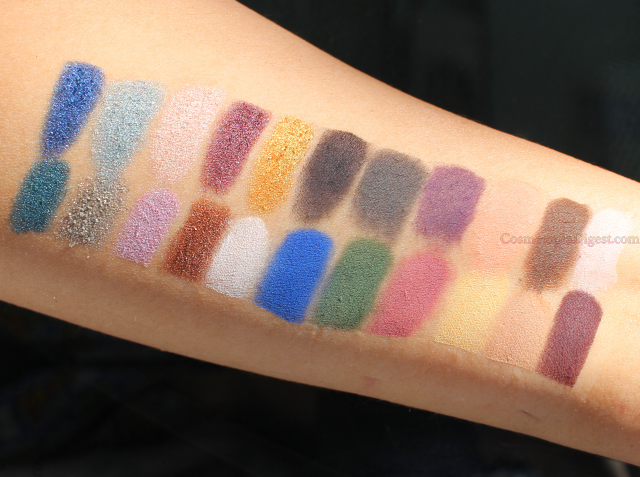 I've swatched the Metal Crush shadows on the left, and the Mattes on the right. All on bare skin. Direct sunlight. Yes, it was a struggle to squeeze in 22 eyeshadows on one forearm. 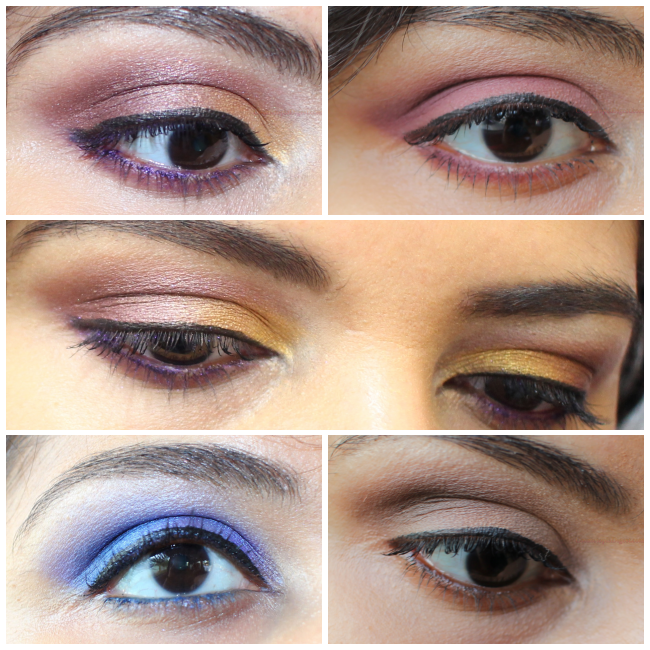 As I said, you can do everything from brights to the subtlest neutral looks with this palette. It costs $60, which, when you look at the size, quantity and quality of the eyeshadows, is a very good deal. Unfortunately, this palette is sold out online. It IS, however, available in-store in Sephora Dubai. I understand that people are still seeing it in-store in Sephora US as well - it depends on luck. 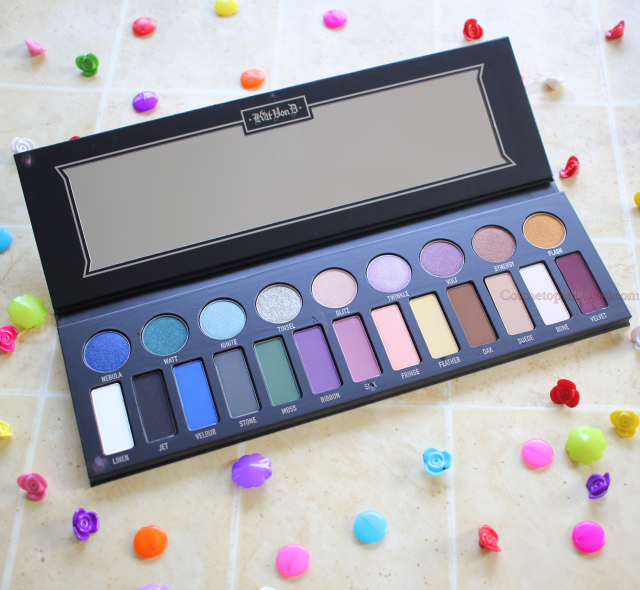 If you do see it, grab it rightaway - this is one palette you will not regret buying.